The best bodyweight exercises are used by the worlds strongest athletes who are martial artists, gymnasts and rock climbers. The best bodyweight exercises are the ones that are going to be the most difficult to perform. If you can train to the point of being able to do 20 one armed pushups, you'll quite likely be able to do 100 regular pushups with ease without ever having trained for them. However, someone who can do 100 double handed pushups won't be able to do 20 one armed pushups unless they specifically train for it! As with all forms of resistance training, the heavier the weight is that you lift, the denser your bones have to become to get to the point of being able to withstand the force of that load. Increasing bone density is among one of the best kept secrets of longevity in humans. If you take into account that a high resistance bodyweight routine builds the strongest muscles (not necessarily large muscles), the most efficient muscles, is best for your long term health and also builds the most functional strength (strength that utilizes the whole body and doesn't isolate parts of it), there is no reason to waste any more time doing endless repetitions of squats, crunches, dumbbell curls, regular pushups and other types of physical exercises that are really just plain boring. The great thing about doing the best bodyweight exercises with high resistance is that you simultaneously build maximum strength (the maximum amount of weight you can lift in just one rep) along with explosive strength (how quickly you can lift or move a heavy weight) even if you are doing the exercise slowly. Any athlete, martial artists or person concerned with self-defense knows how important these forms of strength are. As for strength endurance, it is only a crucial ability if you need it for your specific activity or sport, in which case you'll have to train that separately. From the standpoint of human longevity and real world self-defense, max strength (which builds the most bone density and human growth hormone) and explosive strength is what you want (which is the most valuable in a crisis situation where you have to incapacitate an attacker or beat your opponent by being able to accelerate faster than them). The whole purpose of using the best bodyweight exercises is not to completely replace other forms of exercise or strength training (although it can replace most of it!). This type of bodyweight routine focuses on the things you need to develop, specifically maximum strength and explosive strength. If you can lift the weight of your own body off of the ground with one arm, what do you think is possible in a situation where you need move an opponent or adversary? If you push someone with both of your arms, their combined power will be capable of toppling anyone twice your size, often much to their surprise if you happen to be a lightweight! Bench pressing your body weight is no where near the same as doing a one armed pushup. First of all you are engaging muscles throughout your body when you do a pushup (one handed or two handed). If you've trained your nervous system to tighten all the various muscles that are required in a one armed pushup at once, then if a situation arises that requires this type of movement or something similar, your nervous system already knows how to react along with your muscle strength. Bench pressing serves to isolate one or a few muscle groups away from the rest of your body, so although you can create a lot of muscle bulk with ease, you will have trained your nervous system to work your muscles in a disconnected way. In a real-life fighting situation (or some other sport) you will never be using any muscle or muscles in isolation! By employing the best bodyweight exercises as the main part of your strength practice, you will dominate other people in your sport or area of practice. It's important to be able to move your own body weight from any angle with ease. All this being said, weights do have their place and I discuss this in the last three paragraphs of this article. Pavel Tsatsouline, who brought kettlebells to the West (click this link to find out about them), is an ex Russian Spetsnaz trainer and has written an excellent manual on military calisthenics. His book "The Naked Warrior" is a very unique training program that simply uses the two absolute best bodyweight exercises that you can choose to do. One legged bodyweight squats and one armed pushups literally work every single muscle in the body with the only exception being the posterior chain (which can be developed with dead-lifts, cleans and snatches). 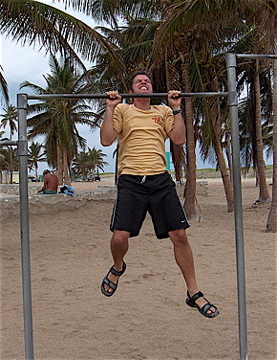 Pavel brings together a variety of techniques from martial arts and even olympic weight training that make the military calisthenics program in "The Naked Warrior" (which he taught to the Russian Spec-Ops) a must read for anyone serious about developing real world functional strength to superhuman levels. A major key behind the types of physical exercises described in "The Naked Warrior" is the way they are trained. Many people take military calisthenics and incorporate them into a bodyweight routine that is oddly similar to a bodybuilding program. This is fine, and you can actually build good muscle bulk this way, however for the purpose of building functional strength that you always have at your disposal, the method of training in "The Naked Warrior" that is known as "Greasing The Groove" (a.k.a. GTG) is ideal. GTG focuses on using a small number of the best bodyweight exercises, a maximum of only 2-4 different types at once, and training only one set of each of these at a time, but multiple times per day (at least 4x but 6+ is best). The other important factor is never training even close to failure on each set. So this results in a number of very short but intense workouts throughout your day. Since you never train to failure, you can train up to 6 days a week and make faster strength gains. You'll also ideally never get sore (if you do you're getting too close to failure) and this leaves you able to use this strength at any moment should you need it. This is how trapeze artist, power lifters and even gymnasts train. As a martial artist, if you just "blasted your guns" in a typical weight training routine and then you happened to get attacked in the street later that day or the next and your arms were still sore, the temporary weakness present in your muscles while they were rebuilding themselves could cost you your life. For anyone looking for real world physical prowess that is always at your disposal, "The Naked Warrior" training program by Pavel Tsatsouline is a bible upon which you can integrate other types of physical exercises once you've learned the basics. You can pick up your own copy of "The Naked Warrior" by clicking this highlighted text link which will take you to the Dragon Door website. 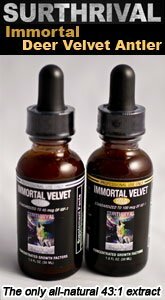 Another benefit to exercising for human longevity and real world self defense or even athletic skill with this program, is that you'll avoid lactic acid build up which has negative health consequences, yet you'll still be increasing bone density, increasing human growth hormone production as well as increasing overall functional strength. These can be added into "The Naked Warrior" training program and even rotated to target and develop different areas of your body. A great resource for finding out how to do these exercises is by picking up a copy of "Convict Conditioning" by Paul Wade from the Dragon Door website by clicking this text link. A good resource for abdominal bodyweight exercises (such as dragon flags) is "Bullet Proof Abs" also by Pavel Tsatsouline which can be picked up at the Dragon Door website by clicking this text link. The following is the downside to practicing an exclusively bodyweight routine. This is why you might want to include some weights and other types of physical exercises in your program. The only movement you can't do with just your body weight is targeting the posterior chain (which is any lifting action such as dead-lifts, cleans and snatches). These are great exercises and becoming weight-o-phobic and avoiding these leads to an imbalanced development of strength in your body. The great thing about these movements using free weights is that they are whole body movements (unlike using the various weight machines in a gym), much like the best bodyweight exercises which build functional strength. One other hurdle is that you can reach a limit when working with just your body weight. Yes it's possible to increase the load of the best bodyweight exercises by creating variations like stopping and holding the movement on the sticking points, doing the whole exercise slower and elevating a part of your body to increase the load (such as your feet during a one armed pushup), however you can use weights with bodyweight routines to keep yourself progressing into new territory. For example with chin ups, you can put a weight into a back pack and wear it while doing pull ups to increase the load on your arms. There is no limit to how strong you can become when you do this! The same goes for bodyweight squats, pushups and other types of military calisthenics. Finally, if your goal is lifespan development, you'll want to engage in some cardiovascular toning types of physical exercises. This can be anything from walking (circle walking in baguazhang is extremely good for you) or running, to strength endurance exercises or wrestling. The heart is a muscle and it benefits from both maximum strength types of physical exercises as well as endurance exercise. In the worlds longest lived cultures or "hotspots", they never actually stop what they're doing and exercise, but rather their lifestyles and work include constant low levels of exercise such as walking up and down hills to get around their villages, farming and gardening without large machinery and even day to day chores such as chopping wood. This constant motion and work is a form of endurance exercise and although it is not as vigorous as running or swimming, since they are doing it all day long, it is actually just as good for them if not better than a shorter more intense type of exercise. Click to return from "Best Bodyweight Exercises" to the "Physical Exercise Benefits" page.